Normally, this wouldn't rate too high for us -- lots of people have ideas about how to use World of Warcraft, and many of them never actually come about. But then again, this is in the Wall Street Journal of all places, so we'll give it a look. If you're on Twitter, you've probably heard about what's going on in Iran right now -- there was an election, the "official" results given were judged as rigged by many involved, and the government seems to be cracking down on both news media and citizen journalism, as well as protesting citizens, to very sad results. How does World of Warcraft fit in to all of this? Andrew Lavallee of the WSJ's Digits blog points to this report by Craig Labovitz, which talks about how Internet traffic has been filtered out of the country around the election. At the very end of his analysis, Labovitz points out that channels for videogames, including both Xbox Live and World of Warcraft, have shown very little government manipulation. That suggests that if the government in Iran does continue to shut down certain channels, citizens there might be forced to spread the news through any virtual route they can, including possibly Azeroth. This is obviously all just analysis and speculation so far -- while there clearly (from those charts) has been interference in the media, no one (as far as we know) has yet had to resort to chatting in World of Warcraft to get their message out, and though what's happening in Iran is made up of some very serious (and seriously unfortunate) situations, the fervor online about using brand new channels like Twitter to share real-time news is often overstated. Personally, I believe that even if Twitter didn't exist, this information would find another way to get out. Still, the interesting thing to take away here is that even our "silly" video games today are actually media on a global level. Continue reading WoW as a channel for news from Iran? WoW as a channel for news from Iran? originally appeared on WoW.com on Sun, 21 Jun 2009 18:00:00 EST. Please see our terms for use of feeds. This was so cute we had to share -- that future Alliance kid at right is Cara's son Riley, no doubt owning it up on Daddy's Death Knight in the battlegrounds. That's right -- the DK who rolled over you with Howling Blast in Wintergrasp yesterday was actually played by a 9.5 month old baby. How's that burn feel? Cara tells us, and the pic was part of a "WoW you're a great father" theme for Riley's first Father's Day. From all of us here at WoW.com, here's a shout out to all of the fathers out there, both Dads of players and Dads who are players themselves. Take a break from taking down Ulduar or grinding out those Argent Tournament quests and make sure to give your Dad a call (and/or the usual tie or socks) today. Or just send him an in-game email for those of you who play with your pops. Happy Father's Day from WoW.com! originally appeared on WoW.com on Sun, 21 Jun 2009 16:00:00 EST. Please see our terms for use of feeds. Wild applause! Mad QQing! The floodgates of Patch 3.2 information have opened, and the comments here at WoW.com reflect it. As much as we love a good debate, [1.Local] will be steering clear of the 3.2 threads -- after all, nothing's set in stone yet, and all the hue and cry begins to sound tiresomely similar after the third or forth topic. Instead, let's start off this week's [1.Local] with a much more novel (and entertaining) method of presenting (and settling) differences of opinion: a comments rap battle. [1.Local]: The epic rap battle comment war edition originally appeared on WoW.com on Sun, 21 Jun 2009 14:00:00 EST. Please see our terms for use of feeds. Reader UI of the Week is back! Each week WoW.com will bring you a fresh look at reader submitted UIs. Have a screenshot of your UI you want to submit? Send your screenshots, along with info on what mods you're using, to readerui@gmail.com. Let it never be said that I don't listen. After last week's sparse screenshot, many of you said you wanted to see a UI in real action, and especially a healer UI. I got a number of good submissions, but Twigleaf's (of Unity on Velen) stood out from the pack by being both very functional and very pretty. Everything has a place, the screen is information-packed, and nothing is ugly. If this was my UI, I would move the center scrolling combat text up a bit, since I like to keep the very center of my screen clear to watch for things. But hey, it's not my UI. Let's see what Twigleaf has to say about it. Reader UI of the Week: Twigleaf's healer UI originally appeared on WoW.com on Sun, 21 Jun 2009 12:00:00 EST. Please see our terms for use of feeds. Hey! Link! You have seventy-two hours left until the moon comes down and destroys Termina. Actually, this picture is from something I hate only slightly less than Majora's Mask -- a saronite node stuck in the air. We've had a ton of variations on the floating-minerals theme submitted, but Nakhama of <Armistice> on Azshara manages to capture the perfect pose of excitement turning to despair. Around Azeroth: Life isn't fair originally appeared on WoW.com on Sun, 21 Jun 2009 10:00:00 EST. Please see our terms for use of feeds. This week's comic list is a good one, so settle in and start clicking. To answer a comment on last week's post, comics can be submitted through the WoW.com tip form, or left as a comment on the most recent Sunday Morning Funnies post. Check out the latest from Cru the Dwarf. Dark Legacy Comics: Toe Stub. This comic from GU Comics is related more to Activision-Blizzard than to WoW specifically, although there is a WoW reference. Check out the latest from Experience Points. The latest Flintlocke vs. the Horde got me laughing, although you should check out the Taco Time comic first, if you haven't. This isn't the most recent comic from LFG, but I thought it might stand alone better. NoObz: To Pull Or Not To Pull. NPC: Just Like Me and Squirrel Flavor. Check out the latest from Teh Gladiators. Backward Compatible has a WoW-related comic out. The Adventures of Disgraph T. Dwarf: Druids with Candy. Check out the latest from Kuo. Sunday Morning Funnies: It is no longer taco time originally appeared on WoW.com on Sun, 21 Jun 2009 09:00:00 EST. Please see our terms for use of feeds. This is a fun thread over on the forums, and though we've talked about favorite cities a few times before, I like the use of the word "settlement" -- it seems different enough from "city" to consider separately. Your favorite city brings to mind images of metropolises like Stormwind or Orgrimmar, but "settlement" could mean anything -- the Mirage Raceway, way out in the middle of Shimmering Flats (those Goblins probably live there, right? ), or the Arrakoa camps around Terrokar Forest. "Settlement" opens up the question a lot, from the biggest cities to the smallest huts on the outsets of Azeroth. So what's your favorite in-game settlement? Booty Bay and Loch Modan get a lot of votes in the thread. Personally, I kind of like the Westfall Brigade Encampment up in Grizzly Hills -- it was fun wandering around there and seeing the old faces from Westfall. Back in the old world, Lakeshire holds a little fascination for me -- it was the first time in the game that I was out of Elwynn and starting to realize just how big the world really was. Breakfast Topic: Favorite in-game settlement originally appeared on WoW.com on Sun, 21 Jun 2009 08:00:00 EST. Please see our terms for use of feeds. The Midsummer Fire Festival should now be live on almost all North American realms. If it isn't, it will be shortly! Not much has changed since last year, beyond the addition of the achievements. Speaking of achievements, while we have our guide to the Achievements of Midsummer, you might not be able to make a significant dent in them today if you made rounds with the flames last year. None of the quests seem to have reset from last year, so getting your hands on the holiday currency to buy the items you need is going to be difficult, to say the least. By difficult, I may or may not mean borderline impossible. I don't expect this to be a permanent issue, we'll probably see a hotfix sometime in the near future since the problem is already being checked out. Of course, that's assuming the issue is something that can be hotfixed. If not, I don't doubt we'll see a fix of another flavor down the road. I don't foresee Blizzard keeping What a Long, Strange Trip It's Been out of players' hands because of something like this. In the meantime, at least you can still take a crack at Lord Ahune. The Midsummer Fire Festival has begun originally appeared on WoW.com on Sun, 21 Jun 2009 07:20:00 EST. Please see our terms for use of feeds. Patch 3.2 has been announced, and shamans saw some changes. That's the short version. Well, we've had the big patch notes bomb dropped on us, and they weren't kidding about changing restoration around, were they? Of course, if you're an orc shaman, you also got expertise with fist weapons added on to your racial, which is pretty neat all told. We also finally saw the debut of the new totem interface, which I can't say enough good things about. The ability not only to drop up to four totems in one GCD but to have up to three customizable sets of four totems for different uses (I plan on making a set just for when there's no DK's around and I can finally use Strength of Earth totem instead of freaking Stoneskin) just made the clouds part and a host of glorious angels descend upon me. Turns out they wanted some money, but still, for a moment it was pretty keen. Before we get rolling, though, I want to remind people: I want your horde screenshots! Otherwise this column is just going to be goat-men from the Twisting Nether, and I know you don't want that. I personally don't care, but you guys get so upset, and while that orc racial does make leveling my orc shaman appealing, I don't really think I have the time. I should probably also mention that rogues got axes in an attempt to give the design team more freedom to actually put some axes into the content. (Yay for one 1h DPS axe in all of Naxxramas, EoE, the Obsidian Sanctum and Ulduar!) I can only look forward to the host of axes in Argent Coliseum that are too fast for shamans to use effectively. On the up side, goodbye, totem stomper macros! We hate you! Totem Talk: Patch 3.2 PTR originally appeared on WoW.com on Sat, 20 Jun 2009 21:00:00 EST. Please see our terms for use of feeds. Today I'm going to focus on an addon that is almost purely cosmetic. XLoot is one of those addons that people will see on screenshots and ask "ooh, what is that?" Essentially, it makes your loot frames much prettier, and somewhat more informative. You can see the default configuration in the screenshot. It's extremely configurable, though; anything from background and border colors to whether the loot frame snaps to your cursor can be set with a simple "/xloot options." Personally, I like my XLoot to not snap to my cursor, since I use auto-loot and the movement is distracting. I also like to lighten it up a bit; glossy black isn't a great fit for my UI. But everyone should be able to find a look that fits. Addon Spotlight: XLoot and friends originally appeared on WoW.com on Sat, 20 Jun 2009 19:00:00 EST. Please see our terms for use of feeds. Each week Arcane Brilliance sits down to write a column about Mages and all things Mageworthy. Big news this week in Mageville: Patch 3.2 is hitting the PTRs. And we all know what that means -- new Mage cat forms. Finally. Having had some time to ingest the 3.2 PTR patch notes, I feel I can now speak about them in a calm, rational manner. The PTR (and all of the additional changes that tend to take place therein) is only just beginning, and yet there are already so many nuggets of newness to devour that my news-stomach feels full to the bursting point. The Isle of Conquest... the death of 2v2 Arenas... Engineering becoming cooler... Emblems of Conquest dropping from heroics (?!)... the fact that Blizzard is now shutting all twinks away together in their own battlegrounds, exiled from the general populace, where they can only pwn each other all day long, until one day Kurt Russell is sent in to rescue the president after Air Force One crashes there... there's simply so much to take in that it's been a little bit difficult to process it all. And yes, once again, looking at those patch notes, I can't help but feel a bit underwhelmed at the 3 lines Mages got. Does every other class really need that much more fixing than us? Really? Still, what's there deserves some analysis. We're not getting much, fellow Mages, but what we are getting is fairly significant. So let's all stop staring at the 72 changes Death Knights and Paladins got for a few minutes and have a little talk about the notes for Mages, such as they are. One nice thing about the lack of changes we're getting: according to the brand new Mage Q&A, Blizzard thinks we're fine, which of course explains why we're not getting messed around with. More on that next week, after I've had a chance to make my peace with God and get my affairs in order. In fact, Blizzard has long suggested a direct corollary between the amount of changes a class is receiving and the general status of the class. Looking at the patch notes, I can't help but notice the following: Mage changes: 3... Warlock changes: 8. I'm looking at this as statistical proof that Warlocks are almost three times as screwed up as Mages. It's good to see Blizzard accept what I have always known: Mages are way better than Warlocks. Just like I've always said. Arcane Brilliance: Patch 3.2 for Mages originally appeared on WoW.com on Sat, 20 Jun 2009 17:00:00 EST. Please see our terms for use of feeds. Back at the very end of last year, the folks at MMO-Champion did their usual excellent work in mining up a heap of models from Ulduar. Now that it's six months later, I have to ask: what happened to all of them? Take the sword pictured above. If you've raided Ulduar, you've seen this model wielded by the Twilight's Hammer cultists in the hallway to the Descent Into Madness. 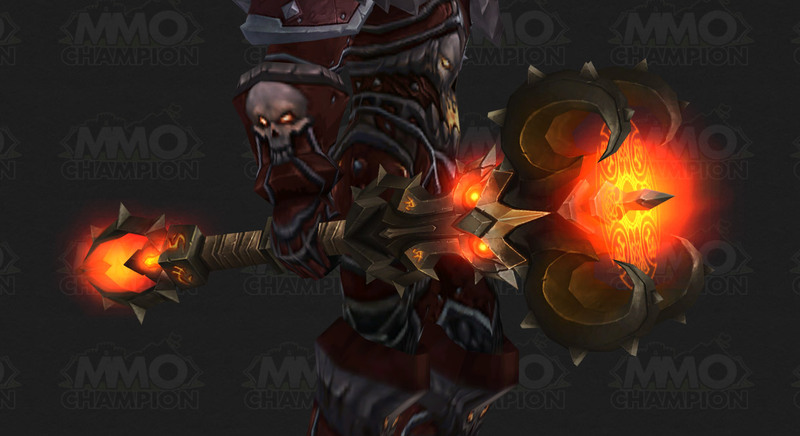 Why, then, is it the case that there are four 2h swords available in 10 and 25 man Ulduar and none of them use this model? Furthermore, why do all four of them in fact use the same model instead? As you can see from the older post, there was an alternative two handed mace model, two more 1h sword models, another crossbow model and an alternate gun model as well. 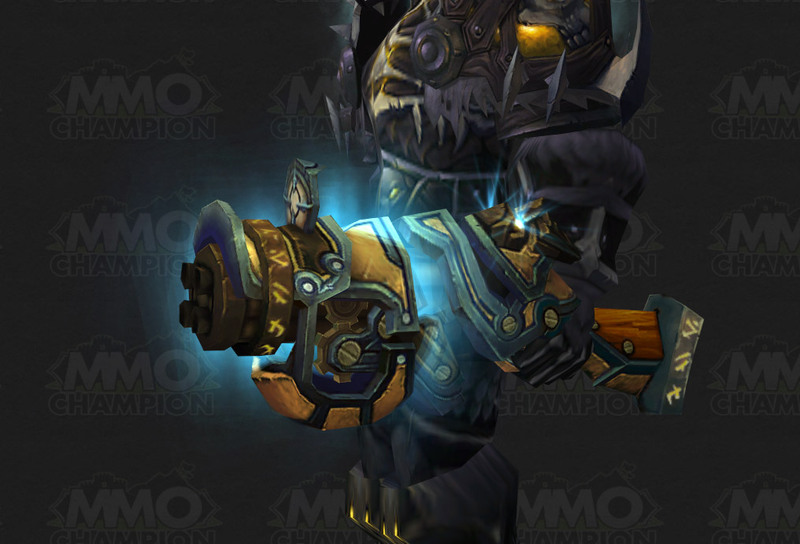 You may not love all of them (our own Alex Ziebart felt that the crossbow model lacked) but you have to wonder, why does every Ulduar gun, crossbow, mace and 2h sword look identical? Why are there only two one handed sword models when there could have been four? Are these models coming in a later instance or are they just there to dress up some NPCs? I actually think that the sword model alternative rocks pretty hard. I realize the mace says 'aspect' instead of 'ulduar' meaning that it might be intended for a later Chamber of Aspects instance, but even so, there was clearly a lot of work making new gear for Ulduar that didn't even get used outside of some NPCs. 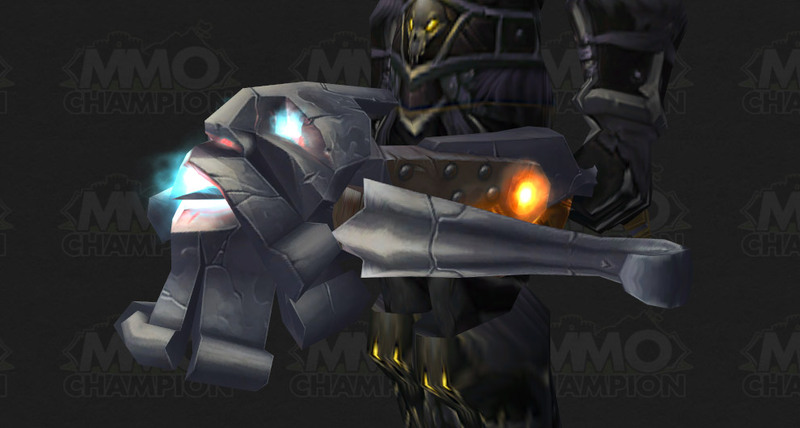 Any opinions on why we got one model for most drops in Ulduar instead of using some of these? The mystery of the missing Ulduar models originally appeared on WoW.com on Sat, 20 Jun 2009 15:00:00 EST. Please see our terms for use of feeds. Our podcast returns once again to the virtual airwaves this afternoon, and this is going to be a good one: we're welcoming back both editor Lesley Smith and Rogue columnist Chase Christian, and as usual, Turpster and I will be on to answer your emails and chat live with you over on the Ustream page. We'll be talking mostly about patch 3.2, of which the patch notes hit our eyes just this week. There are some more details about the upcoming Crusaders' Coliseum instance, the Emblem system (that will definitely inspire some discussion), and all of the other changes that caught our attention in there. Plus, Midsummer Fire is almost upon us, so we'll chat about that as well. Tune in this afternoon over on the our Ustream page at June 20, 2009 3:30 PM EDT, or you can jump after the break to see an embedded feed. If you'd like to email us questions, feel free: the address is theshow@wow.com. And what the heck -- we'll be giving some loot card codes away on the show today as well, so tune in if you can and you might pick up some free in-game loot. See you this afternoon! WoW Insider Show live today at 3:30pm Eastern originally appeared on WoW.com on Sat, 20 Jun 2009 13:30:00 EST. Please see our terms for use of feeds. Here's a change that will probably be by turns amusing, exasperating, or a relief, depending on who you are and how you play: In a new section recently slipped into the official 3.2 PTR patch notes, Blizzard revealed that they plan to add a queue to Wintergrasp in Patch 3.2. In short, you can queue up by visiting a Battlemaster or entering the zone within 15 minutes of the game start. Only 100 people will be allowed to fight on each side of the battle, to be chosen randomly from the battlemaster and from the zone, with level 80s receiving highest priority. When Wintergrasp was first introduced, even people who otherwise disliked PvP found it fun, and some old-timers found it be about the closest thing to the fabled world PvP battles of old in Hillsbrad, Ashenvale, and other such places. Patch 3.2 gives Wintergrasp a queue originally appeared on WoW.com on Sat, 20 Jun 2009 12:00:00 EST. Please see our terms for use of feeds. Around Azeroth: Burn baby burn originally appeared on WoW.com on Sat, 20 Jun 2009 10:00:00 EST. Please see our terms for use of feeds. Another week has brought us to another weekend, which means it's time for us all to work out what we're playing this weekend. The Midsummer Fire Festival begins today, but surprisingly enough, it's not what any of our crew seem to be looking forward to for weekend World of Warcraft entertainment. Leveling alts? Raiding Ulduar? Or, gasp, dare I say it, some kind of crazy life beyond the keyboard? How dull! There's summer to celebrate! For what the WoW.com team is up to this weekend -- and to let us know what you're playing this weekend -- read on! Continue reading WRUP: Summer ahoy! WRUP: Summer ahoy! originally appeared on WoW.com on Sat, 20 Jun 2009 09:00:00 EST. Please see our terms for use of feeds. I've been killing Sarth for months and, oddly I still enjoy it. Sans the last half an hour which normally involves bickering and the following question: 'What's a raid roll?' repeated ad infinitum. However each time I enter the Chamber of Aspects, I find my eyes drawn to the other still-sealed portals and wonder when they will open. It's clear the Dragonflight portion of Wrath lore is still incomplete and I live in hope these new raids might be tied into patch 3.3 or even the new expansion. So tell me readers, when do you think Blizzard will start opening the other Sanctums? What kind of raids would you like to see for each flight? Do you think it might tie into the whole Infinite Dragonflight questline or be something to do with the Lich King? What are your thoughts, constant readers? Breakfast Topic: When are we going to see the rest of the Chamber of Aspects? originally appeared on WoW.com on Sat, 20 Jun 2009 08:00:00 EST. Please see our terms for use of feeds. A shaving of pencil lead, bark of a dead tree, the ashes of one of Kafka's short stories, bound together with a drop of writer's blood. Set it aflame, and the pact is forged! Let all who are bound by this Blood Pact be forever cursed to reconsider content distribution! Also, here's the Warlock column! Ah, mid June. That blissful period between the end of finals, and Blizzard answering my questions. Time to sit back, unwind, and get back into my gaming and my writing. However, since I didn't spend much time in WoW during this past finals week, I found myself lacking inspiration. So, as I am wont to do now and again, I spent some time perusing the writings of my class columnist colleagues, hoping to happen upon some inspiration. And as it turned out, I stumbled across a gem of a post from the gentlemanly fellow over at Arcane Brilliance. He really is a rather dapper chap. Sadly, I am particularly ill-suited to write a post on useless Warlock spells. You see, I have a dark and terrible secret. And not just the ones that come standard issue for all card-carrying Warlocks: this is a truly dire bit of personal arcana which I am mortified to admit in public... but here goes: I am a spell pack-rat. I use action bar supplementing addons just so I can keep every single spell or ability I've ever acquired somewhere on my screen. If my raid leader demanded that I ride my felsteed around in eleven circles, then dismount and dizzily cast a rotation made up entirely of Curse of Weakness and WANDING, then I wouldn't even need to open my spell book. Might need to find a new raid leader, but at least I wouldn't be unprepared. Given my unseemly disability, I've decided that rather than directly emulating my esteemed counterpart, I'll simply write a column from the opposite perspective! Many spells in a Warlock's arsenal are unduly maligned as "useless" by mobs of rampaging children demanding to be buffed. It's downright unfair to call these spells useless when in fact they are only (if you'll forgive my overused joke) usefulness challenged. Blood Pact: Of spells and bad metaphors originally appeared on WoW.com on Fri, 19 Jun 2009 21:00:00 EST. Please see our terms for use of feeds. This is a nice piece of hefty (as in, anyone can get it, not just the top raiders) loot from Twitter's own @Wibbels. It's a sword from around level 60 with a breathtaking proc. There's actually only one, and it's a crazy chance on hit: if it procs (around 5%), the enemy hit is silenced for a full six seconds. Complete silence (no spells, no casting, no nothing) for six seconds, 5% of the time. Pretty awesome, right? Unfortunately, as with everything, there's a catch. Phat Loot Phriday: Silent Fang originally appeared on WoW.com on Fri, 19 Jun 2009 20:00:00 EST. Please see our terms for use of feeds. Tales of the Aggronaut sent us this multipart guide he wrote on one of the things we all do in the game that might nevertheless be tough for a lot of people: actually getting a group together. It sounds like a simple thing (just ask people whether they want to group up or not), but as you probably know from experience, sometimes it can be pretty tough. So TotA set out, instead, to do a from-the-ground-up guide, from how to find and network with people in the game to how to build a group piece-by-piece. And I like it a lot -- he starts with a preamble with some general networking tips, including finding social channels to join (many guilds and realms have a few social channels constantly filled with folks LFG or interested in playing socially) and putting together a solid friends list, then goes on to explain how to communicate (probably a great read for anyone in any part of the game) and then how to actually build a WoW group, from core classes to splitting up class roles. Very impressive -- while most veteran players have probably heard or done this stuff before, it's nice to see a clear, concise guide that starts at the beginning. And it's even nicer to see a guide that emphasizes the social aspect of gameplay. Even here at WoW.com, we're all about gameplay tips, from profession insights to class balance discussion, but sometimes we overlook that to play a social game like World of Warcraft, you sometimes need to focus on social skills. As much as theorycrafting and gear upgrading can help, sometimes it's better to learn how to be friendly and social instead. Groupcrafting: The art of getting a group together originally appeared on WoW.com on Fri, 19 Jun 2009 19:00:00 EST. Please see our terms for use of feeds. You have some time to make travel arrangements for BlizzCon, but you should be aware of your options now and be looking for deals. In general, it is best to make your reservations at least 2 weeks in advance for most carriers, but there are sometimes last minute deals and also specials run periodically. Take your time and choose wisely. Los Angeles: LAX is the largest airport near Anaheim, but is an hour away, with good traffic (a rarity in Los Angeles). Regardless, it may be your cheapest option and most airlines fly there. Preparing for BlizzCon: Getting there by air originally appeared on WoW.com on Fri, 19 Jun 2009 18:00:00 EST. Please see our terms for use of feeds. I am pretty notorious for not updating my addons often enough (I think some of the versions I have must be years old by now), but maybe with this, I'll be better: Reader Fin runs a website that tracks RSS updates of addons from most of the database sites, so all you need to do is hook that feed up to your reader of choice, and then whenever a new addon drops (either one that you're waiting for, or all of them, if you just want to watch them go by), you'll see it pop up in your reader, ready for inspection or a download or whatever you like. He's also hooked it right up to a Twitter feed, so you can also tune in on Twitter and watch the new addons go past. I thought there might be too many going out, and that all those addons might spam up your Twitter feed, but actually if you've got a full slate of follows already (I've got about 200 talkative folks), it's not bad at all -- enough to keep you interested, but not so many that you feel flooded. Of course, this probably still won't help me get my addons updated -- only putting an extra hour or two of free time in the day will help me accomplish that one. But it'll nice, at least, to know they're out there. Get addon updates via Twitter or RSS originally appeared on WoW.com on Fri, 19 Jun 2009 17:00:00 EST. Please see our terms for use of feeds. The WoW CMs continue their polling of rare and hard-to-find items: first, we got queried on Mr. Pinchy, and now the forums have a poll about that more recent bounty, the Reins of the Green Proto-drake. As you probably already know, you have to first get revered with the Murloc faction of the Oracles, and then you have to buy a "Mysterious Egg" once every seven days from their quartermaster... that probably hasn't yet given you the mount you want. Personally, I've gotten plenty of Aged Yolks and quite a few noncombat pets, but not my Proto-drake. And my experience is hardly singular -- according to the poll, a full 55% of respondents have not yet opened up their Cracked Eggs to find the mount. 4% found it on their first try (bastards -- that number seems incredibly high), and almost 14% went for the joke "Oracles?" answer, or maybe just have no idea what the question is about. Obviously this is hardly a scientific poll, so we can't calculate drop rates or anything like that (most database sites put the drop at around 2%, which means on average 50 eggs to a drake, or almost a year of farming), but it's pretty clear that the Proto-drake is a supremely rare commodity. The long wait for a Green Proto-drake originally appeared on WoW.com on Fri, 19 Jun 2009 16:00:00 EST. Please see our terms for use of feeds. Pink Pigtail Inn has what is probably the most involved guild anniversary I've ever seen. We've seen quite a few anniversaries and events come through Guildwatch, but this one takes the cake: a huge competitive scavenger hunt, complete with out-of-game clues, banned class abilities (so teams could be balanced out), and even self-made quests involving the guild's lore. It's probably rare to find a group of officers that can be this committed to something normally considered "an RP event," but obviously it worked out, because the whole guild really enjoyed it. The context Larisa puts this in, however, is even more interesting. According to the Daedalus Project (a series of surveys of MMO players -- we've mentioned their work before), the majority of players can't celebrate a guild's anniversary anyway, as they haven't been in their guilds for even a year yet. I've never considered it, but it's true: while we are very attached to our guildies when we do find a good guild, we aren't really attached to them for very long, relatively speaking. There are stories of guilds going on for decades, but even those guilds have players coming and going -- if your guild has the same group of people playing together for a few years, you're probably in a smaller group than you think. PPI's example is a great one for any guilds who have been around long enough to celebrate it. Celebrating a guild anniversary in style originally appeared on WoW.com on Fri, 19 Jun 2009 15:00:00 EST. Please see our terms for use of feeds. The We Have a Tabard series is designed to help guild leaders, officers, members achieve their goals to maximize their cooperative experience. I'm relatively new to leading a raiding guild. I've been working on building and training my team for about six months. I've been leading the recruiting and correcting members, managing raids, and in general trying to make my online family as functional as possible. It's a lot of work for one person, and no matter how much I love my guildies I have to admit that I am tired. The best thing that I've ever done for myself and my guild is to ask for help. I have some great players in my guild that are well respected by other members and the server community. They have expertise in areas that do I do not. Probably most importantly they are less likely to mince words than I do and are willing to do what it takes to get the job done. Having some backup has helped some become more invested in the guild and has really lightened my load. We Have a Tabard: A little help from my friends originally appeared on WoW.com on Fri, 19 Jun 2009 14:00:00 EST. Please see our terms for use of feeds. Over the past few days, some upcoming professions changes for Patch 3.2 have been announced, and although they are not as detailed as they could be, several of the changes will have quite an impact. First and foremost, every profession-specific buff is being upgraded. This includes an Enchanter's ability to enhance their own rings, a Leatherworker's bracer enchants, and more. For a complete list of the current profession bonuses, check out Insider Trader's guide to Profession-Specific Buffs, parts one through three. These buffs also answer some of the concerns surrounding the upcoming Jewelcrafting nerf that epic gems might be introduced without a buff to the Dragon's Eyes, which, in combination with the fact that these gems will no longer be prismatic, would effectively squash the Jewelcrafting bonus. Jewelcrafters will also do well to note that they will be able to acquire epic gems by prospecting Titanium. Combined with a Blacksmith's two extra prismatic sockets, this powerful duo is one of the most popular profession combinations. In addition, Engineers will be seeing some welcome changes to their profession that may make it more appealing. Unfortunately, some of the details have not been made public, so the competitiveness of their self buffs, for example, remains to be seen. Insider Trader: Patch 3.2 profession change analysis originally appeared on WoW.com on Fri, 19 Jun 2009 13:00:00 EST. Please see our terms for use of feeds. The new Chronicles of Leeroy episode 6- Stranglegank Vale has been released by Herculean Productions. If you remember from the last episode, Leeroy and friends were levelling through their first instance. Now, the Horde party must handle their most difficult challenge so far: getting ganked in Stranglethorn Vale. There have been a few production enhancements on this episode. The costumes are a little more defined, and I feel like the scenery has been stepped up a notch. Also, you get to see the Herculean team do their first interpretations of Alliance life. Even the computer graphics are a little more refined and contextual. The movie has an interesting meta-commentary moment, when the two Alliance gaurds are standing next to each other. One actor uses a prop for the quest-giving exclamation mark hovering over his head, while the other guard's exclamation mark is a computer graphic. There's a brief moment when they kind of look at each other questioningly, and then go back to waiting for a Player Character to come get a quest. I wasn't sure what to make of the scene, but it clearly stuck out in my head. Overall, I think the adventures of Leeroy are a lot of fun. Herculean Productions obviously puts a lot of effort and heart into these movies, and I enjoy every one I see. WoW Moviewatch: Chronicles of Leeroy episode 6 - Stranglegank Vale originally appeared on WoW.com on Fri, 19 Jun 2009 12:00:00 EST. Please see our terms for use of feeds. Those of you who know certain past posts of mine could probably predict what my mind jumps to from that news: how will the loot be done? I see four three major possibilities. 10-normal and 25-normal drop the same gear, while 10-heroic and 25-heroic drop a tier above (10n = 25n < 10h = 25h). 10-normal drops one kind of gear, 10-heroic and 25-normal are equal to each other and better than that, and 25-heroic is best of all (10n < 10h = 25n < 25h). All four raids drop different levels of gear, 10n < 10h < 25n < 25h. If you've read my past stuff, you could correctly guess that #1 would be my favorite option. I don't really want to argue it here (or in the comments), because I've had that conversation more than I care to already. Continue reading How will they do the loot in Trial of the Crusader? How will they do the loot in Trial of the Crusader? originally appeared on WoW.com on Fri, 19 Jun 2009 11:00:00 EST. Please see our terms for use of feeds. Christie of <Karma> on Alonsus-EU writes in, "You know how it is. You're happily raiding in Ulduar, you make an offbeat comment about how druid healers are all lowly scum... and then one of them hops into an Arachnopod Destroyer on the way to Mimiron and then proceeds to barbecue you alive for your impertinence. Do not anger the Trees, their vengeance is vast and terrible to behold." This particular vengeance-bringer is Restodurul, also of <Karma>. Around Azeroth: Revenge of the druids originally appeared on WoW.com on Fri, 19 Jun 2009 10:00:00 EST. Please see our terms for use of feeds. The ability to turn off experience gains is coming in patch 3.2, and is rightly being touted as a feature to enable twinking (to go along with the new battleground experience system). However, that's not all that turning off XP lets you do. Remember how people have been asking for classic realms with the level cap set at 60 (or 70)? Yeah, here you go. Level a guild of characters to 60, pay 10g to turn off XP gain, and raid the old world to your heart's content. Nethaera mentioned as much in a blue post yesterday, constituting the first supportive mention of classic only raiding that Blizzard has ever made, as Adam noticed. She does mention that this may change during testing, like everything, but for now: classic content lovers, rejoice! Don't forget to loot your core hound. Turn off XP gain for classic raiding originally appeared on WoW.com on Fri, 19 Jun 2009 09:00:00 EST. Please see our terms for use of feeds. With the wiping of the official PTR forums, the release of the patch 3.2 PTR notes, and the slew of other new tidbits released yesterday, it's a sure sign that the start of patch 3.2 testing is imminent. I figured this would be a good time to find out whether you, our beloved readers, actually use the PTR (or Public Test Realm) or not. Now I have to go on the PTR (it's written in tiny print on my WoW.com contract) but I also wander in there because I want to. I'm a journalist purely because I have no patience whatsoever and this is a great way of seeing how the next patch is going to look ahead of time. While I was initially not that excited about 3.2, some of the stuff revealed yesterday has gotten me quite excited. There seem to be two camps: Team A loves getting online first, seeing all the new content as soon as possible while Team B would rather wait for everything to go live on the real realms. The rest? Well they're not quite sure what a PTR is. Which team are you? Breakfast Topic: Do you go on the PTR? originally appeared on WoW.com on Fri, 19 Jun 2009 08:00:00 EST. Please see our terms for use of feeds. Second up in the class Q&A (Shamans were first) are Mages, those lovable glass cannons. Or are they? The Q&A opens with Ghostcrawler discussing public perception of the class, with a prompt of "a lot has changed since the days when the 'glass cannon' description was applied." They like the different feel between the three trees is in a good place, with Frostfire possibly providing a fourth aesthetic. They have decided that "king of AoE" is no longer a good niche to put any class in, so now they're trying to give both AoE and single-target to all DPS specs (with "extra effort" to make sure mages do good AoE). Class Q&A: Mage originally appeared on WoW.com on Fri, 19 Jun 2009 07:00:00 EST. Please see our terms for use of feeds. I promise we'll get back to our Ulduar guide for tanks and DPS warriors next week. For this week, however, since we're midway through the sixth month of 2009 and we've seen patches up to 3.1 released (and we're waiting on 3.2) I thought it would be a good idea to go back and cover some of the things a leveling warrior might want discussed. We get emails from all kinds of warriors, and so it's only fair to cover the concerns of warriors who aren't raiding Ulduar but rather just setting foot off of the dock in Howling Fjord. Before we get started, though, the upcoming Patch 3.2 changes for Warriors in their current entirety: Armored to the Teeth: This talent now provides 1/2/3 attack power per 108 armor, up from per 180 armor. Try not to get too excited, people. First off, I'm often asked about stats for up-and-coming warriors. We have covered some of these before back in the beta, but the beta was a year ago now and things have been changed and polished. First off, I'm going to link all the posts of interest to a leveling warrior and discuss how they may have changed, and then I'll try and cover some more general advice. Building Up To It covers some target numbers and stats to focus on. I should note that this was written before the changes to Armor Penetration made it much, much better as a DPS stat for warriors: the more ArP you have, the better it is as a DPS stat until you have enough ArP to reduce target armor by 100%. We covered Hit and Expertise in two posts, one for DPS warriors and one for Tanks. The tanking post is still accurate as of 3.1, but the talent changes to Arms and Fury mean that there is currently no talent that reduces chance to dodge for Fury Warriors and Arms has both Strength of Arms for passive expertise and Weapon Mastery. We discussed the dangers of overstacking a stat to the exclusion of other, also necessary stats. Finally, we covered gearing up in a four part post just before Wrath launched Parts one, two, three and four were all published before Wrath itself had actually come out, but they're still reasonably accurate to help your warrior get from 70 to 80, We covered weapons between 70 and 80 too. The Care and Feeding of Warriors: The Leveling Warrior in Wrath originally appeared on WoW.com on Thu, 18 Jun 2009 22:00:00 EST. Please see our terms for use of feeds. Welcome to Scattered Shots. I am Eddie "Brigwyn" Carrington from The Hunting Lodge and I'll be your tour guide each Thursday as we explore what makes our Hunters tick and how we can make them better. Well, maybe not your mother. But you know us Hunters, we really love our macros. Unlike some other games out there, World of Warcraft gives players a pretty simple method to help customize their playing environment. We all know about the cool add-ons like Recount and RatingBuster. Now add to that the ability to arrange the look and feel of our User Interface and Blizzard really has done something special. Instead of trying to tackle those, I thought we could talk about the one that gives many of us players some difficulty: macros. And you know what? They really don't have to be that complicated. Before we get started, I would be remiss if I didn't at least explain little bit about macros. At least I need to define what macros are what they are not. Macros are a way to combine several commands (attacks, emotes, or other actions) and combine them into a single button press or click. Scattered Shots: Hunter macros even your mother could love originally appeared on WoW.com on Thu, 18 Jun 2009 21:00:00 EST. Please see our terms for use of feeds. Two Bosses Enter ... but only One Boss Leaves, in WoW.com's series of fantasy deathmatches. This season's bosses hail from the five-man instances of Wrath of the Lich King. It's the day that time stood still: Chrono-Lord Epoch (The Culling of Stratholme) versus Volkhan (the Halls of Lightning). Who'll stop who (/snicker) in this week's five-man Wrath boss deathmatch? Assume that the Chrono-Lord and Volkhan share similar levels, health pools and a comparative overall damage output (including Volkhan's golems). Prince Arthas Menethil is not a part of this encounter. This match takes place in neutral territory (although we'll allow Volkhan an anvil to create his golems). What do you think would happen during this battle? Post your theory on how the action will go, then cast your vote for who you think will be left standing at the end. Two Bosses Enter: Chrono-Lord Epoch vs. Volkhan originally appeared on WoW.com on Thu, 18 Jun 2009 20:30:00 EST. Please see our terms for use of feeds. It's that time of year again, folks. Frankly, I'm glad to be back in the realm of more reasonable and just plain fun holiday achievements, because I hated School of Hard Knocks, and wound up giving up and quitting the achievement after hours of fruitless battleground deaths. Fortunately, the Fire Festival has a lot less potential to drive you to the nuthouse, and a lot more potential to grant experience, gold, and cool items. From what I've seen, Blizzard hasn't changed the holiday since its 2008 incarnation, which is actually a good thing in a number of ways because last year's revamped and expanded Fire Festival was great. A note on eligibility: your character will need to be at least 50 to hand in the items needed for King of the Fire Festival, and at least 65 to get the higher-level quests necessary for killing Lord Ahune in Slave Pens. With that said, we still recommend that lower-level characters participate, because you'll wind up with a ton of experience and gold even if you can't complete the meta-achievement. Should you complete the meta, you will be awarded the "Flame Keeper" title. I've listed all of the required achievements in the order I think will be easiest/fastest for the average player to do. UPDATE: Your character is currently unable to honor/desecrate any flame (including city flames) that you've honored/desecrated in 2008, which will make getting enough Burning Blossoms to purchase Midsummer clothing difficult, if not impossible. I'm still trying to find official confirmation that this is a bug (and I assume it has to be, as otherwise the meta-achievement isn't doable), but it also appears that fires have been added to Northrend as well. I'm heading ingame right now to assemble a list with coordinates and will update the post later. The OverAchiever: Guide to Midsummer Fire Festival achievements originally appeared on WoW.com on Thu, 18 Jun 2009 20:00:00 EST. Please see our terms for use of feeds. Blizzard plans "to deliver more Battlegrounds to the players as often as we can"
Oh, man. That last bit made me want to change my underwear. Blizzard is actually paying attention to Battleground enthusiasts, realizing that while Arenas are nice and all, a lot of players love the BGs, too. New Battlegrounds "as often as we can?" Yes, please! Head on over to the official site to read Stockton's interview in full. Bombs, cannons, parachutes, angry Generals... 3.2 is shaping up to be one explosive patch, indeed. PvP Q&A with Blizzard's Cory Stockton originally appeared on WoW.com on Thu, 18 Jun 2009 19:30:00 EST. Please see our terms for use of feeds. Brilliant. Just brilliant. If you've been keeping up with the many changes in Patch 3.2, you might get an inkling that PvP is going to change drastically and for the better. Adam has already gone through the whopper announcement that Blizzard hinted at some time back: players can now gain experience from the Battlegrounds. It's something I'd wished for since the days of vanilla WoW and the developers have finally gotten around to implementing it in the next major patch. Does this mean the death of twinks? Not necessarily. Players can opt to toggle experience gains on and off by going to Behsten in Orgrimmar or Slahtz in Stormwind (best-in-slot, get it?) and ponying up 10 Gold. But wait, there's more! Players who turn off experience gains will only be placed in the same Battleground queues as other players who opt not to gain experience. That's right -- twinks will be facing off against twinks. Twinks who have always contended that it wasn't about the unfair gear advantage will finally get the opportunity to test their mettle against equally geared opponents. Enjoy. That's just the tip of the iceberg, though. After the jump, we'll take a look at a whole bunch of changes that will impact World of Warcraft PvP from the obvious (Arena and Battleground changes) to the not-so-obvious (item and ability changes). Let's hit it. What Patch 3.2 means for PvP originally appeared on WoW.com on Thu, 18 Jun 2009 19:00:00 EST. Please see our terms for use of feeds. We had a bit of a minor freakout when we heard that the Rusted and Ironbound protodrakes might be getting removed as rewards for the Ulduar meta achievements in Patch 3.2, and then even more of one when the slow trickle of information about 3.2 turned into a firehose. Bornakk mentioned the change initially with the caveat that it was their intention to remove the drakes eventually, but that he'd seek definite confirmation either way as to whether it was happening in 3.2 or not. There's been no update about it in the past few weeks. Well, after a thorough reading of the 3.2 patch notes, I don't see a single trace of anything saying the drakes are getting removed. At the risk of counting my protochickens before they hatch, I think we might be safe, given how fast 3.2 looks like it's coming out. This is at least a relief for my guild, who's doing pretty well on 10-man hard-mode progression but ... is there a word worse than "dismal"? ... on 25-man hard-modes. Maybe there's hope for us yet. Should we get the soul-crushing confirmation that they'll be removed with 3.2, we'll be sure to let you know. There's still a lot of time for change on this one, though -- maybe it was an accidental omission, maybe it'll get decided on later -- but for now, you can breathe a little easier knowing you might be able to keep hacking away at those hard modes to get your undeniably awesome drakes even after the Argent Coliseum is commanding your guild's attention. Maybe Ulduar drakes aren't going away in 3.2 after all originally appeared on WoW.com on Thu, 18 Jun 2009 18:30:00 EST. Please see our terms for use of feeds. I discussed last week about how Hunter trapping and crowd control had gone the way of the dodo. And now as reported earlier today, we have much to celebrate with the release of the official Patch 3.2 PTR Notes. Ghostcrawler and the development team are really showing us Hunters some much needed luvin. Aspect of the Cheetah: Can now be learned at level 16. I was really wondering what we were going to do now that mounts were available at 20. It seems we are in good hands. We only have 16 painful levels of slow run until we can get Aspect of the Cheetah and start zipping around. Deterrence now has a new visual spell effect. New graphics are always cool. Patch 3.2 brings some Hunter love originally appeared on WoW.com on Thu, 18 Jun 2009 18:00:00 EST. Please see our terms for use of feeds.